The time has come for the city of Detroit to privatize its wastewater treatment facilities. The environmental health of the Great Lakes is at stake, to say nothing of the pocketbooks of Metro Detroit citizens. The Detroit Free Press has editorialized that, "It's an embarrassment to the city that for almost two years, until March 1999, the [city treatment] plant dumped untreated sewage into the Detroit River because equipment was too worn out or insufficient to handle the volume of gunk running through it." U.S. District Court Judge John Feikens appointed a committee to investigate the problems of the Detroit Water and Sewage Department. It found evidence of poor management, chronic delays, inefficient purchasing and hiring rules, lack of training, and a general tardiness and absence of leadership in reacting to problems known to the department. The city is expected to spend more than $366 million from July 2000 through July 2001 on operations and management of its wastewater treatment system. 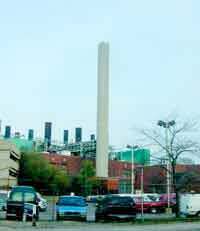 It could spend less and meet its own goals for "meet[ing] federal, state, and local requirements for the clean air and clean water standards," which the department lists as its number one goal in the city budget, if it would be willing to contract out for the operations and management of its system. This past September much of Metro Detroit was underwater because the system couldn't handle the rainfall of a major storm. Although Mayor Dennis Archer has been charged by the U.S. District Court with solving the pollution problems, there is little reason to expect things will get better. City employees have no real economic incentive to provide better wastewater treatment services, and there is little the mayor or city council can do about the situation unless privatization becomes an option. Indeed, besides getting better service for less money, one of the major advantages of privatization is that governments can discover — sometimes for the first time — how much it actually costs to provide a given service. Without private contracting, a mayor must rely solely on city employees and their respective unions for information on the cost of wastewater treatment or any other city service. When city employees are forced to bid against private firms, on the other hand, the mayor or city council can make a more-informed decision as to whether the city should contract out for operation and maintenance or engage in some other form of public-private partnership. There is a good deal of evidence that privatizing city wastewater treatment service would result in significant savings. The results of a 1999 National Association of Water Companies survey of 29 public-private water-sewer facilities found that: (1) Prior to private contracting, 41 percent of the systems were not in compliance with EPA regulations, while within one year of the contract all were in compliance; (2) All of the privatizations resulted in lower rate increases than were foreseen prior to privatization; (3) In 17 percent of the facilities, cost savings were between 10 percent and 40 percent; (4) Investor-owned facilities improved customer service at a lower cost; and (5) In 24 percent of the facilities, private firms provided investment capital for system improvement or purchased the facilities from the municipalities. A partnership between Milwaukee's wastewater treatment system and United Water, a private firm, has reduced the system's annual operating costs by 30 percent. This has allowed the city to reduce sewer fees by 15.5 percent, even as it improved discharge compliance 50 percent beyond the Wisconsin Department of Natural Resource's minimum requirements. This earned the company a $50,000 bonus from the city. Detroit will be forced to upgrade its wastewater treatment system in the near future to comply with environmental legislation that has been passed by Congress. According to Gary Fajita, assistant director of wastewater operations, capital costs are expected to reach $2 billion in the next five years alone. Detroit has little ability to secure such financing at a reasonable cost, given legal constraints on its borrowing capacity and the fact that the city's debt rating is barely "investment grade." Some institutions are not allowed to invest in bonds that are not investment grade because those bonds are considered too risky. While the city's rating has been improving, many institutions are still precluded from buying its bonds, which limits its buyers and raises its costs. On the other hand, private firms would be both willing and able to supply the capital needed to replace and repair aging facilities and construct new ones. The initial political instinct will be for suburban municipalities to attempt to seize control of the wastewater system from Detroit. 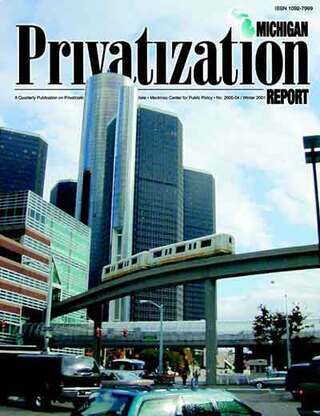 This push for suburban takeover will increase as rates for Metro Detroit residents rise to fund system upgrades. The political battle will be divisive, and no matter how it turns out, the fundamental problem — the fact that the government holds a monopoly — will not be solved until taxpayers and ratepayers have the opportunity to choose their service provider. Contracting out and competitive bidding for a properly drafted contract will discover what the most efficient mix of private-public ownership and operations is. This is one of the few issues upon which environmentalists, consumer advocates, business owners, and ratepayers can agree. Everyone benefits from cleaner water and lower rates. Rather than engage in wasteful and destructive political battles over turf, the mayor and city council of Detroit should begin drawing up contracts for operations and maintenance of the city's wastewater system and let the bidding begin. Gary Wolfram, Ph.D., is George Munson Professor of Political Economy at Hillsdale College in Hillsdale, Michigan.